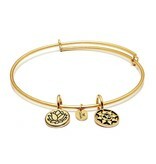 Wear your Chrysalis Mantra bangle and entice good spiritual energy into your life. The lotus flower has inspired a special significance of timeless beauty over many centuries. Echoing the clarity of heart, soul and mind, it will bring good luck, strength and honour to yourself and those around. Finish: 14k Gold Plate Standard = 7 to 8.5 inches Your bracelet will come packaged in a Chrysalis suedette pouch. Stack them up for maximum effect ! !